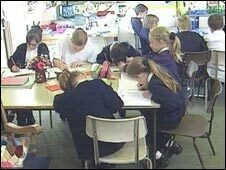 Sir Jim said parents should be able to make an "informed choice"
Children in England born in July or August should be able to start school part time if their parents want them to, a government study will recommend. Statistics have long suggested those born in August do less well in exams than those born the previous September. But Sir Jim Rose's study will reject NUT suggestions that summer-born children should have a delayed start. Instead, he will say all should start in the September after they turn four, but only part-time for the youngest. At present, children in England and Wales in many local authorities are expected to start school in the September after their fourth birthday. However, some authorities delay school life for younger children until after Christmas, while others make use of part-time starts. Sir Jim was asked to examine the issue by Children's Secretary Ed Balls following concerns about children born in the summer doing less well than their older classmates. His interim report, to be published on Monday, will say it is better for children to start school as early as they can - so long as they have attended good nursery schools. "Parents need to be given the facts so they can make an informed choice about when their child starts school because evidence suggests it can have a major impact on the rest of their life, particularly if they come from a disadvantaged background," Sir Jim said. "But we also need to be sure that teachers are giving younger children the right support and are not letting them get elbowed out by older youngsters." His report will suggest children could be eased into school life by attending only in the mornings or afternoon, for 15 hours a week, at first. Mr Balls said he recognised parents' concerns about their children being taught alongside older pupils. "Teachers shouldn't mix up maturity with ability," he said. "I don't want a child wrongly held back as being low ability in primary school when it's their age that's the problem." Christine Blower, the National Union of Teachers' acting general secretary, said a more radical solution would be to follow the example of Scotland and Wales and end national testing in English primaries. "It is quite obvious that summer-born children lose a year in their education, but the current system treats all children as if they were all born in the autumn term," she said. Is five too soon to start school? What will curriculum review mean?